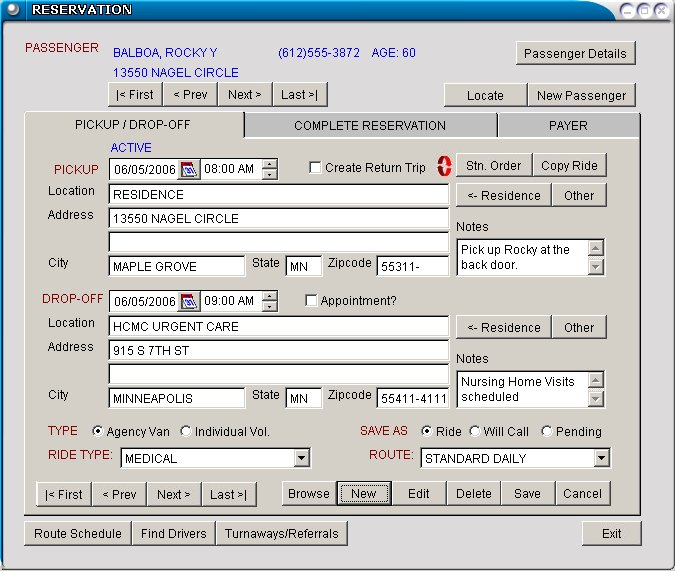 Powerful and affordable scheduling software for community transportation service providers. Includes van and volunteer driver rides, standing orders, route maps and optimization, driver logs with passenger needs, demographics, billing, 5310 statistics, driver training/background, vehicle maintenance, many standard reports, and DIY Query tool. Comments: We transitioned from an Access database to keep track of our elderly and disabled county transportation program to Ride Express. I don't regret this decision at all. I greatly appreciate being able to run various reports on the transportation services we have provided whether by vehicle or volunteer driver. This has saved me a great deal of time and stress knowing the correct information is being provided to me quickly. I also appreciated the very quick project turnaround when I "ordered" the creation of a unique report. Mostly because I didn't have to spend the time creating a query to get the data! We have been using Ride Express for 8 years and it fits our small business. Comments: Pros: The customer service is the best. Phone calls and emails are returned promptly. They assisted us in getting a hosted server. The program is intuitive and makes sense. It doesn't take a bunch of screens to fill in to take a reservation. This program has saved us so much time in doing our reports. The drivers love the layout of their schedule, simple and easy to read. Cons: On the reservation screen you can only make 2 legs of a ride at a time. I would like to be able to add legs as needed to the same reservation.